Hi everyone! 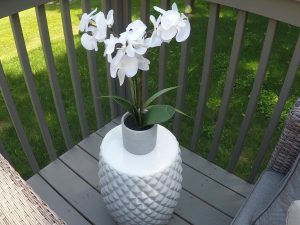 So I finally got around working on my outdoor project and décor and I could not wait to share! It has been pushed back due to the weather changes in New York, but it’s finally [almost] completed and I am beyond excited 🙂 . Grab a snack and let me show you around! You can find a full product list at the end of the post. 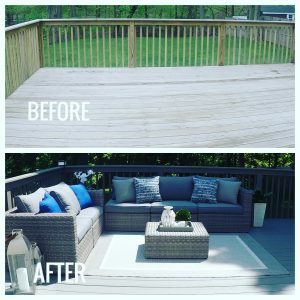 We have a small deck with raw wood so the first step was to find the right color to stain it. It had a few stain marks that were very visible so I needed a semi-dark color to make sure it was all covered. I struggled to think of a color to go with at first, but I ended up with gray… of course! (if you don’t already know about my obsession with gray, check out my blog post here!). I wanted something different, but at the same time, pick a color that went well with what I had in mind for the overall décor and color scheme inside as well as outside the house. We looked through a few deck paint catalogs and found a perfect blend of pewter gray. 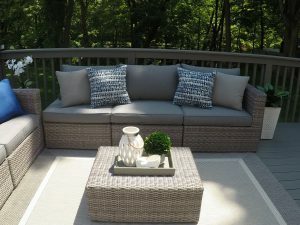 The next challenge was to find the right outdoor conversation set – I wanted a modern and contemporary gray wicker set with gray cushions. I know what you’re thinking, too much gray right? I was looking to create the perfect contrast of grays and adjust to my taste, which I think worked out 🙂 . 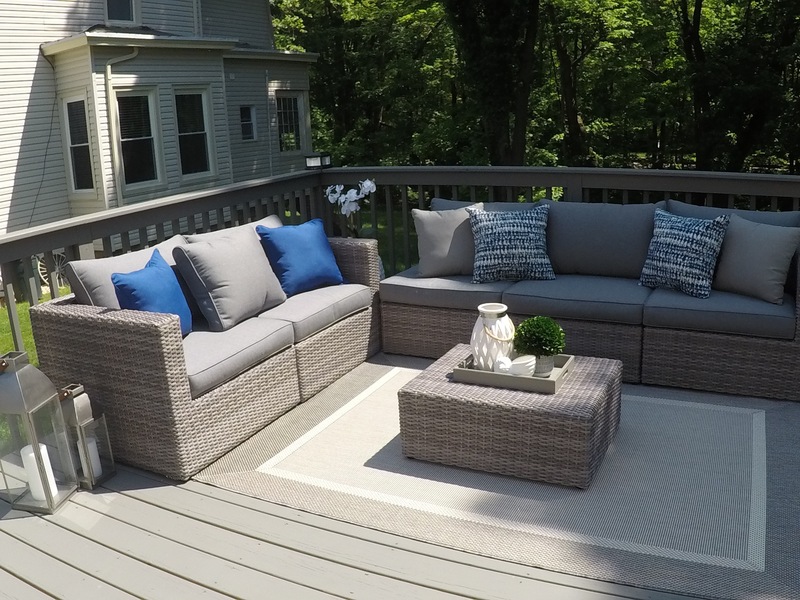 Selecting the right wicker set was a bit challenging due to all the overwhelming options, but with my research, I noticed there are actually NOT a lot of gray wicker-and-cushion combos to choose from, so that narrowed it down a little. Removable and washable cushion covers – make sure you can wash em’! Weather and water resistant – this is key for any outdoor set, you want to make sure your set will last! After the search, narrowing down options, and looking for the right set at a good price, I found Mr.Right! Not only did it check off all the things I was looking for, it also came with 3 beautiful blue pillows – does it get better than that? I was really happy with my choice and was ready to move on to the more exciting part, the décor! 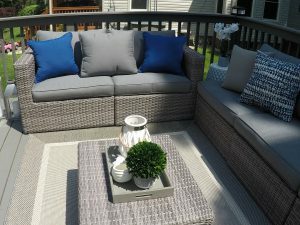 First, I opted to add an outdoor rug. I love accent rugs overall (the inside of my home is full of them), so I wanted to keep it consistent and include one in the outdoor décor as well. I picked a champagne/grey textured rug which brought all the grays together nicely. To spice it up, I added a few accent pieces in the mix: a ceramic garden stool (which I planned to use as an outdoor side table), a large artificial green plant with a very pretty geometric pattern, and a set of two decorative lanterns. I added a small artificial orchid with a gray ceramic base to decorate the stool, just to make it interesting. 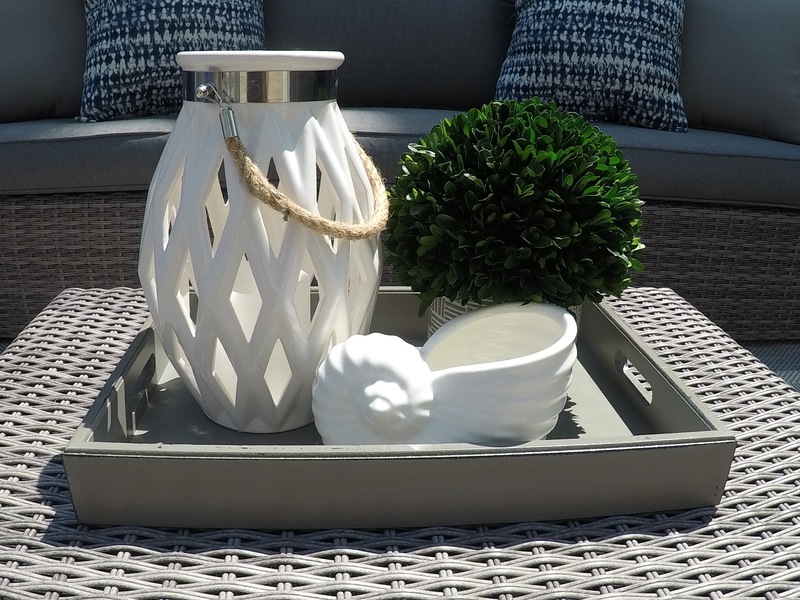 For the coffee table, I went with another accent plant and a smaller sized decorative lantern in white. Our backyard is very dark at night so I wanted to add as much light as I could. The lanterns have LED candles (with AA batteries bought separately), which you can find in a variety of stores or online! There are a number of ways you can decorate your outdoor space and it mostly all comes down to your style and personal preference. Like all things in design, start with the color and go from there! You can keep your décor even simpler and add just one accent piece to the coffee table for example. My coffee table was more on the larger side, so I wanted to fill up the space as much as possible. The selection process can be overwhelming, but again it’s a matter of choice and what you prefer. 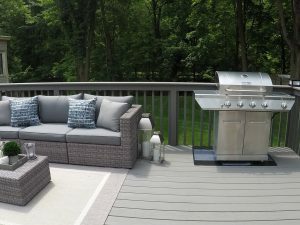 It is also more challenging to buy a patio set online, but just make sure to do your research, read the reviews and be sure it works for you. Also keep in mind you are more likely to find it at a better deal online than in-stores 🙂 . Work with your space and make it simple, yet creative and fun! I’ve added a full source list below. Comment below with any questions or tips!